It doesn’t say how much you should drink everyday or how often throughout the day so I’ll leave that to your discretion or should I say imagination? Ok it does say drink responsibly but does that mean I should mix my drinks, share with friends, drink shots only or always store it in the freezer? Buying vodka to make homemade Limoncella, meant a trip to the supermarket, and yes we all know every supermarket does the “cheap / basics” brand, the “standard” brand and the “super-duper special pay more” brand. I just never realised it applied to Vodka, and I’m now wondering what else is considered “Everyday”, what am I missing out on? Previous Post Previous post: It’s off with the sunhat and on with the wellies. Drank a fifth of vodka EVERY day for 35 years. Clean and sober now 10 years, 8 months. Thank you Carl, and well done you! I think my point is, although done with humour, is that why is this being sold as everyday? ridiculous marketing!! How does this go with my “everyday” wine? I’m not sure I’d mix them……. can you tell me what is vodka ? I dodn’t know that Tandy, thank you! I normally buy the branded stuff too, but I couldn’t resist buying this one just because of it’s label !!!! Perhaps finding something to cook your vodka in every day could be a fun challenge. There are some great pasta sauces that use vodka, though that alone could get a bit boring a bit fast! I’m so envious of you being able to buy wine and spirits in the supermarket; it’s just not fair and I miss it! I make a lemon, fennel and vodka risotto which is totaly delicious, but it’s not something I could eat every day 🙂 I seem to remember Vodka Jellies being great……. Wishing you a lovely weekend too Nia ! Funny you should post this – I think Sainsbury´s does a Basics one too which made me chuckle (and wonder). Sent you an e-mail a while ago re meeting up – did you get it?! Hi Tanya, yup ainsbury’s does a basics one !! Can we get the Limoncello recipe please?? Oh the joys of supermarket marketing….. sometimes they need to think about what they are saying (literally or indirectly) or get a normal person to review things before they are put into production! Limoncello recipe is in the making 🙂 And I’ll obviously need help with its consumption, responsibly though! I’m wondering the same thing Linda! The trouble is that these things are usually made with cheap ingredients, so can be quite different! Clinkers! I will stick to wine though if you don’t mind. Have a happy responsible drinking weekend. Hope you have a great weekend too Mandy ! When I tended bar, it was “well”, “call”, and “top shelf.” Order a cocktail without specifying and you got the well liquor, the cheapest. If you want to upgrade, you mention the brand name and that usually meant a “call” brand. If you wanted the best, you asked for one of the liquors located on the shelf behind us. These were the “top shelf” brands. This is what I call background reading prior to holidays John! Hah! Isn’t it amazing the tricks that are used to influence susceptible consumers? Hmm. I wish we could find everyday vodka here to make the limoncello and cranberry liqueur. Alas, the cocktail craze has taken hold and even the “cheap” vodka isn’t so cheap any more. Ha ha ha – so funny!! Oh, Claire, I’m looking forward to your recipe, too. I’m not a big drinker, mainly because I live alone, and like to drink only socially, but I love citrus in a boozy cocktail. Thanks! I know what you mean about living alone, when I did I’m sure I drank far less than I do now! Hopefully the Limoncello will be a nice treat for us all 🙂 Hope you have a super weekend Cindy! 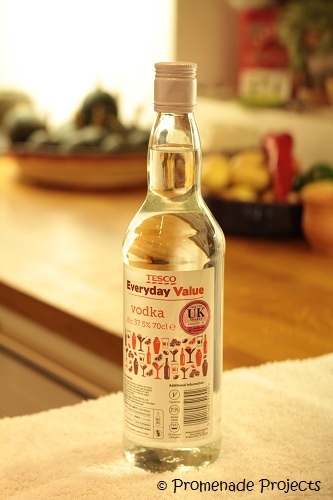 I am just wondering what Lord Sugar would say if one of the teams on The Apprentice came up with ‘everyday vodka’ concept! Looking forward to the Limoncella recipe. Cheers Claire! I never realised that the ‘everyday’ was an instruction! Do they do everyday chocolate to go with the vodka? Everyday vodka sounds like a recipe for disaster. I know what you mean Eva ! I haven’t tried it yet Celia, here vanilla pods (good ones) are very expensive, you know what I think that vodka is cheaper to buy – now where’s the logic in that! I love limoncello. I can’t wait to read your recipe. Your post reminded me of a story I heard on the radio a few years ago in which the journalist gathered up “everyday people” to do a blind Vodka taste test. There are so many people here that say they prefer particular brands, but when doing the blind test they more often than not picked something other than the brand they claimed to prefer, often choosing much cheaper vodkas :). Maybe they should just stick to the Everyday brand, lol. I am by no means a vodka expert, not by a long shot so am not passing any judgement. I just found the whole thing amusing. Cheers! Great story – those people obviously weren’t “super-tasters” with fabulous tastebuds. I’m not sure I could tell the difference either, and my the time the lemons and sugar are added I’m sure it will be fine! Most ordinary vodkas in the UK and America are quite bland. Russian and Polish vodkas have a lot more flavour and characteristics. A good taste test would be between a regular brand like Smirnoff and Zubrowka. We tend to drink vodka with a mixer or in a cocktail, whereas Poles and Russians drink it neat (and of course some other countries too). About three years ago my son was studying at St. Petersburg University and living with a Russian family. I visited him there and the host family organized a special dinner, which featured numerous vodka toasts. I generally don’t drink anything stronger than beer, so I was scolded by my hosts for sipping the vodka, instead downing it at one go. I drank three shots, which was about my limit. Danny told me later that this family are practically teetotalers by Russian standards. I can’t imagine drinking vodka every day. I’ve heard about drinking vodka throughout a meal, I’m sure I would have been under the table – and very quickly!! A socalled ‘moderate’ amount of alcohol [like a small amount of 70% dark chocolate] is great for health: daily [with two days off a week] sounds great – but NO, vodka very definitely has no claim to special fame!!!! And I was born in a vodka-imbibing nation which has huge problems with health! Well, I prefer wine, thank you, or a single malt or Tanqueray gin or a super cognac on occasion . . . limoncello: have never had any, and the draw appeal is minus zilch 😀 ! So ture about the health problems associated with regular / heavy drinking. It’s so sad. What I don’t get is that the marketing people behind all this think it’s ok to promote it with othe rgoods as “everyday” ! Ha yes there is celi, bog roll included, but somehow that wasn’t as photogenic ! I knew you’d appreciate that !! Aahhhhhhh indeed! I need to source the lemons though, I’m on th elook out for lemons from Sicily…. maybe I should just get a flight 🙂 Now wouldn’t that be grand ! 🙂 I love it, Limoncello that is ! I hope you post the recipe soon, you’ve got my curiousity up now! You’ve set my mind to a possibility. I had to give up on making fruitcake, but I still have time for limoncello! I’m going to give that a thought. And with all the good discussion about Vodka, I’ll be able to make a good choice. Every day…probably not a good idea for me! 🙂 LOL! LOL at you Debra, I can’t blame you for not making a cake in the weather you are having !! But Limoncello can be drunk anytime….. I am one of these boring people that can’t drink very much without getting ill, blinding headaches, insomnia, red face, etc and I get drunk very fast too. I have a theory that I lack some metabolising enzyme and my body just reacts to it as if it is a poison. that sounds like a dreadful reaction to have Joanna . and I bet you are right it’s an enzyme thingumy. I bit like the enzyme whatsit that relates to dairy allergies, (i.e. me), but thankfully my reaction isn’t so severe. Hmmmmmmm so many choices !! And it’s your Limoncello recipe that I’m following !! Hope you have a super week Teresa ! I’m drinking coffee this morning…I like my vodka out of the freezer no matter when or how I’m imbibing! It was fun to read the comments on this post Claire, well done! Can’t wait to hear about the Limoncello. One more thing the more expensive – or pure brands seems to leave one with less of a headache the next morning….just sayin’. I really enjoyed (as ever!) the comments, so many different opinions and experiences, as always I learn lots ! Hmmm, it says Everyday “Value”, so I assume then, one should drink as much as possible so that by a simple mathematical equation of division, one would reap the benefit or as much value as possible.. ahem.. That did sound official, didn’t it, lol! If I drank vodka everyday life as I know it would end… and not well, I suspect. Everyday Vodka, that’s the name. In Finland we have huge Vodka factory which makes Finlandia Vodka, but I am not drinking it, because I love Ouzo.